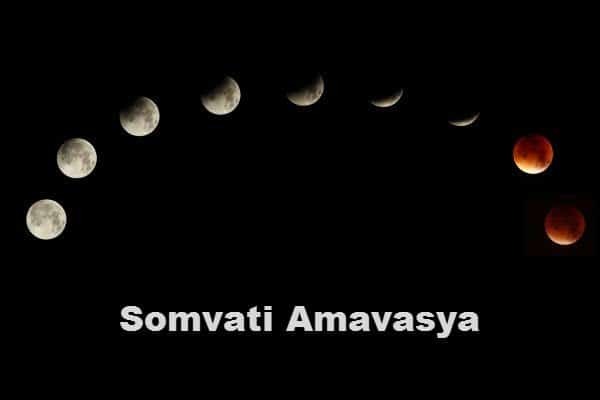 In fact, the Somvati Amavasya is considered to be the most auspicious Amavasya by the Hindus. It occurs once or twice in a year. In this presentation, we have described the importance of Somvati Amavasya. As Somvati Amavasya falls on Monday, it is often associated with Lord Shiva. Hindus offer prayers to Lord Shiva on this day. Moon holds a deep significance in Astrology. Moon is said to govern mind and thought. People with weak Moon tend to become pessimistic in nature and develop depressive tendencies. They are often indecisive and can become fickle minded and try to accomplish multiple tasks unreasonably. It is believed that worshiping and Daan karma (donations) undertaken on the day of Somvati Amavas help to get rid of bad effects of weak Moon in one’s horoscope. In 2017, the Somvati Amavasya will be celebrated on 18th December 2017. It is regarded as a very auspicious day by the Hindus. They take a holy dip in sacred rivers such as Ganga, and Yamuna. They also undertake various pujas and rituals on the day of Somvati Amavasya. In fact, the significance of Somvati Amavasya was narrated to Yudhistira, the eldest Pandavas, by Bhishma Pitamah in the epic Mahabharata. After the Kurukshetra war, Yudhistira was worried about the Kuru-Pandavas dynasty. He approached Bhishma Pitamah to take advice how to rejuvenate the dynasty for his coming generations. Bhishma advised Dharmaraj Yudhistira to observe Somvati Amavasya Vrata. He told Yudhistira that whosoever observes the Somvati Amavasya Vrata would get long living and noble children. He also told Yudhistira that taking a holy dip in the sacred rivers helps devotees to get rid of their various problems. It is also believed that on Somvati Amavasya taking a holy dip in the sacred Ganga River brings peace to our deceased ancestors and washes away all our sorrows and sins. According to Hindu traditions, the Peepal Tree is considered very sacred. Offering prayers to the Peepal Tree hold a special significance on the auspicious day of Somvati Amavasya. Married Hindu women tie a sacred thread around its trunk 108 times. They perform a Parikrama around the Peepal Tree 108 times, with the offering of milk, flowers, sandal paste, and vermillion being offered. They sit under the Peepal tree and chant mantras to please the Almighty. Married women also observe a full day fast on the auspicious day of Somvati Amavasya for the long life of their husbands. Even those women who want a good match for them also keep a fast on Somvati Amavasya. In fact, people worship Lord Shiva by offering milk mixed with water to Shiva Lingam. Somvati Amavasya is also important for performing Pitra Tarpan (offering to the ancestors) as it brings peace to their souls. It is believed that people suffered from Pitra Dosha should keep a fast on this day as it frees them from this Dosha. Dhyan, Daan, Jaap, and Sadhna did on the Somvati Amavasya help in getting rid of all problems and sorrows. Once there lived a money lender. He had seven sons and a daughter. While he married all his sons, he could not find a befitting match for his daughter. This grieved the moneylender and his wife a lot. A Sadhu used to visit his house regularly. The Sadhu would bless the daughters-in-law but never blessed the daughter. The daughter told the thing to her mother. She put the question across to the Sadhu. However, the Sadhu did not reply and left quietly. This worried them a lot, and they called a Pandit. The Pandit saw the Kundali of the daughter and told that the daughter was destined to become a widow. The mother then pleaded the Pandit for a solution to the problem. The Pandit told them that there is a washerwoman who lived on the island of Singhal. If that woman would agree to apply Sindur (vermillion) on the forehead of the girl, her fate will surely change for the better. He also told the daughter that she should keep the Somvati Amavasya Vrata following that. It will help to overcome the fate. The mother then sent her daughter along with the youngest son to that island. On their way to the island, they came across the seashore and wondered how to cross it. They sat under a tree and saw a vulture’s nest. A male and female vulture used to live there along with their babies. One day it so happened that a snake entered their nest and attacked the babies. The girl witnessed this and immediately jumped to save the vulture’s babies from the snake. She killed the snake and relieved the vultures of their plight. This generous act pleased the vultures a lot, and they helped the girl and his brother cross the sea and reach the island. She finally reached the washerwoman’s house. She then served the washerwoman for many months. The washerwoman got pleased with the girl and applied Sindoor on her forehead. When she returned back to her house, the girl observed Somvati Amavasya Vrata. This reversed her fate. She got married and lived a happy married life with her husband. Somvati Amavasya is considered a special day for getting rid of Pitra Dosha in your horoscope. You should offer sweet water, sweets (white) or kheer and Juneau to the Peepal Tree on this day. You should circumambulate the Peepal tree for 108 times and apologize to God for your known or unknown sins. Giving bread to the crows on this day also gives a lot of benefits. According to the “Shastra,” our forefathers come to our house on the day of “Amavasya.” So, one must donate on the day of Somvati Amavasya according to his or her capability. You should also give five fruits to the cow on this day. The first bite of your food should be offered to a cow in the name of the forefathers. If one practices these religious acts, they get blessed by them. Apart from the above remedies for Pitra Dosha, you can also perform the following acts for getting rid of your sorrows and problems on the day of Somvati Amavasya. You can donate food to poor kids. You should worship Lord Shiva and Lord Vishnu. You should keep fast on this day. You should worship the Peepal Tree is the morning. You should do Parikrama of Peepal Tree 108 times. Doing Mauna Sadhna (remaining silent) is considered very beneficial on this day. You should take a bath in a holy river such as Ganga. It brings peace and prosperity and provides relief from grief, pain, and sorrow. It helps the ancestors to attain salvation. You can also do Parikrama of Tulsi plant 108 times.